Is Your Office Designed for Inclusion? Kim Vanderland and Bernice Boucher on universal, inclusive design for people of all abilities. Image via Death to Stock. How many people in your office have some form of disability? You might be surprised. An estimated one out of every three employees has a special need requiring accommodation, and most simply make do as best they can with the workplace they have. The good news is that more companies are going well beyond American Disabilities Act (ADA) requirements, and proactively creating offices that enable people of all abilities to be as productive as possible. In this article, JLL‘s Kim Vanderland and Bernice Boucher explain how you can design for employees of all abilities in your workplace. The concept is known as “universal design”, but we prefer to call it “inclusive design”, because the goal is to include all workers in the organizational workplace. By either name, the idea refers to a broad spectrum of ways to produce buildings, products, and environments that are inherently accessible for people with or without disabilities resulting from aging or other conditions, without requiring adaptation or retrofitting. The goal is to provide a workplace that is welcoming, enables everyone to reach the areas needed, and to fully use office equipment and resources. 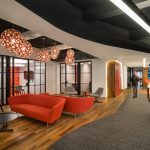 Designing for inclusion from the start helps sidestep the need for retroactive accommodation later, and it also creates a much more inviting workplace. A key aspect of this approach is that it avoids segregating or stigmatizing employees with special needs, enabling them to focus on the work without having to request accommodation or draw attention to their particular need. Examples of inclusive design include features you may already experience daily, such as door handles that are levers instead of knobs that require a firm “grip and twist”; flat-panel light switches rather than small toggle switches that require dexterity; easy-to-read large-print equipment control labels; overhead and task lighting options; wide interior doors and hallways, and alcoves with generous turning space. In the workplace, inclusion features also include quiet workspaces and environmental controls for those sensitive to noise, light, heat, or cold. Clearly, these design features also appeal to people without disabilities. In fact, best practices in modern workplace strategy encompass some naturally inclusive ideas, such as providing different kinds of workspaces for different kinds of work and work styles. A person with ADHD or a mood disorder might prefer a quiet workspace with task lighting — but so would a person working on a complex project with a tight deadline. For many organizations, inclusion is becoming a critical issue because a growing number of employees are likely to have disabilities or impairments. In particular, aging baby boomers are prone to mobility, hearing or vision limitations as they age. Concurrently, incoming millennials are more likely than older workers to have been diagnosed with autism spectrum disorder, attention deficit, and other less-visible cognitive or mental health disorders. In addition, returning veterans in the workplace may also have disabilities unique to their service. For companies facing a talent shortage as baby boomers retire — and many companies are — offering an inclusion-designed workplace provides a major advantage in the war for talent. Designing for inclusion opens the door to a broader recruitment pool without placing undue focus on people with special needs. Healthcare reform is yet another force spurring interest in inclusive design. One impact of the U.S. Patient Protection and Affordable Care Act (ACA) is that it makes it easier for employers to hire people with disabilities, and for people with disabilities to join the workforce and trade Medicaid health insurance for private insurance. Designing for inclusion opens the door to a broader recruitment pool without placing undue focus on people with special needs. It’s also important that public awareness of obvious and not-so-obvious disabilities has created greater understanding that people of all abilities can contribute in the workplace. As the most comprehensive federal statute protecting the rights of people with disabilities, the landmark Americans with Disabilities Act of 1990 profoundly changed how society views and accommodates people with disabilities, and that change has had a profound affect. The stereotypical view is that “disability” means “wheelchair”, but the reality is that a disability or impairment may be quite subtle, and it may not be permanent. More employers are beginning to recognize that the spectrum of disabilities extends beyond the visible and the physical. A glance at the ADA shows that the law considers a wide range of conditions to be potential disabilities, including cognitive, mental health, and learning disorders. And, of course, on any given day, a person might have a short-term condition such as a painful sports injury, stress, or simply a headache. Despite a temporary impairment, the employee may be perfectly capable of having a productive workday if he or she is able to access to the right kind of workspace. The term “universal design” was originally coined by Ronald L. Mace, a well-known architect, product designer, and educator, and further developed with the 1963 publication of Designing for the Disabled and 1997’s Designing for the Disabled: The New Paradigm, by Selwyn Goldsmith. Goldsmith came up with the idea of the dropped curb or sidewalk ramp, which is now a common feature in street crossings around the world. Since then, the practices of inclusive design have been further developed by the Design for All movement and numerous standards and design organizations. In 1989, Mace established The Center for Universal Design at North Carolina State University, which has become the leading source of information, technical assistance and research on the topic. The stereotypical view is that disability means wheelchair, but the reality is that a disability or impairment may be quite subtle, and it may not be permanent. While most facilities these days already are designed to meet ADA and OSHA standards, those regulations establish only a baseline. Many organizations — sometimes inspired by their architects and interior designers — are moving toward the seven principles of universal design formulated in 1997 by an N.C. State committee, led by Mace. Simple and intuitive use: Use of the design is easy to understand, regardless of the user’s experience, knowledge, language skills or current concentration level. Size and space for approach and use: Appropriate size and space is provided for approach, reach, manipulation, and use, regardless of the user’s body size, posture or mobility. A complete description of the principles is available on the North Carolina State University website. Contrary to popular perception, designing for inclusion does not necessarily require costly upgrades or radical adjustments in workplace layout. In fact, modern office concepts are already leading the way. For example, today’s office layouts are increasingly likely to offer a choice of workspaces for difference kinds of work and preferences. A person with ADHD, for instance, can simply choose the workspace that is best for them that particular day, not a “special” office set aside for people with special needs. A greater focus on employee health and well-being as a key to productivity has brought such features as sit-to-stand desks and circadian lighting into the office. These features benefit all employees, but are especially meaningful to those who are sensitive to light, temperature, or indoor air pollutants. Follow the “closed-fist rule”, in which storage units and other equipment has U-shaped handles, push latches, side-hinged doors, and other elements that can be operated with a closed fist — which means that everyone will have access. In the restrooms and break room, provide levers rather than knobs. Include ramps instead of — or in addition to — stairs. Use different colors for horizontal and vertical surfaces, including changes in elevation, to help those who are vision-impaired, and also reduce the risk of trips and falls. Provide lever handles instead of door knobs, or install doors that can be opened with an elbow or even the tip of your nose that make entering and exiting easy for people with limited dexterity — or carrying a laptop and a cup of coffee. Adopt adjustable lighting operated by touch panel rather than toggle switches or small knobs. Eliminate obstacles in the line of travel in hallways and open-layout spaces. Provide blinds or curtains on windows to reduce glare on computer screens. Invest in adjustable chairs and desks, with storage in range of reach for all employees, and ergonomic keyboard and computer supports. Install multi-sensory safety alarms (auditory; visual), and large-print instructions for emergency and safety equipment. Also worth noting: it is possible to build in inclusive design features without compromising on aesthetics. Where earlier versions of universal design products were utilitarian rather than unsightly, the building industry has caught up to the growing demand. Today, it is not difficult to find building and interior design products that promote accessibility with style, at reasonable cost. Smart building technologies are the next frontier for inclusive design. Already in use in many buildings, smart building systems automatically adjust in response to real-time conditions, maintaining a steady temperature and air flow to prevent excessively hot or cold areas and improve indoor air quality. Some workplaces now provide mobile apps that employees can use to preset their preferred lighting levels, temperature and even the window blinds to personalize their workspace. In addition to providing these productivity benefits, smart building technologies actually reduce costs by optimizing building performance. Whether you’re building out a new space or renovating your current office, it’s best to bring in an integrated team at the beginning of the process. Our core team typically includes our workplace strategists and real estate professionals alongside team members from HR, IT, and the corporate real estate function to define the organization’s vision and goals. This approach helps us to understand the organization’s demographic trends and what the workforce will look like in the future. Our role is to pose questions about possible challenges the current and future workforce may have in a typical office environment, and to suggest parameters for the office design. To augment this core team, we often collaborate with universal design consultants, architects, and designers who are experts in designing for inclusion. These resources can recommend products that help mask sound or door styles that are both aesthetic and accessible for all. As universal design becomes increasingly mainstream, new products are coming on the market and providing more options for companies interested in inclusive design. Many companies today have a diverse, multi-generational workforce that comprise not only different working styles, but also different needs for accessing office resources and facilities. Creating an office that works well for the broadest possible range of workers removes the challenge of accommodation after the fact and enables all employees to be comfortable and productive — and makes their unique needs not so special after all. Designing for inclusion is a win-win for companies and workers alike. Fast forward 10 years: what will your workplace look like?